This is the third game in the educational Adventures with Edison series. 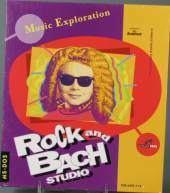 The game focuses on famous composers of classical music. The plot revolves around a certain studio that produces musical video clips. Accompanied by Edison, the player takes part in whole life-cycle of such a production. First of all, the rock band consisting of 4 members (solo, bass, drums, and chord) is created. Song is selected from a list or composed based on riffs and chords after that. Based on the song, the video is produced in means of three aspects such as camera view, background, and special effects. Song and video contains 16 cycles, and it is the player's task to customize them. When the video clip is completed, it may be viewed in the studio's theater or sent to another game profile. There are four pre-defined video clips created by Edison himself. Before the video production takes place, numerous adjustments may be made as well as musical information may be gained. For example, it is possible to adjust the looks and sounds of each item in drum base, customize the looks of the scene for a band, adjust the sound f/x, etc. Guitar riffs with keys and chords may be examined and played. Musical instruments, their history and place in symphonic orchestra is provided. Musical pieces of eight famous composers may be performed with four different instruments. Each game profile has its own game session. The looks of Edison may be adjusted as well as game session progress is saved / loaded for each game profile.